The Republica Oriental del Uruguay, under the presidency of Jose Antonio Artigas, declared its independence from Spain in 1811. From 1816 to 1821, the new Republic fought a losing war against Brazil. 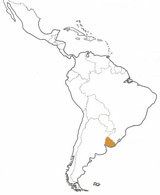 Following another Brazilian war, this time including Argentina, Uruguay was finally declared an independent state in 1825. 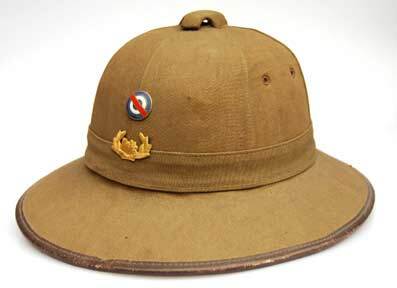 It was only during the final years of the nineteenth century that helmets began to appear on Uruguayan soldiers. Dragoon helmets of the French type, bearing the national coat of arms on the front and sporting a red mane, were worn by the cavalry for ceremonial duties. At the same time, German-style Uhland-type helmets also appeared in some other cavalry units. It was not until the presidency of Jose Battle y Ordoñez, which began in 1903, that peace and order finally arrived and modern Uruguay was born. After the First World War, the only helmets worn by officers were a variety of the Casco de corcho. In the late 1920s, the cavalry of the Republican Guard was issued several models of the German, black Pickelhaube with the gilded national state emblem on the front. During the 1930s, the police were issued the US M1917-A1 as well as the French M26 with plain front flaming grenade emblems. The armored units of the police used the French M35 with grenade emblems. In 1940, in an effort to elevate the Uruguayan army to European military standards, a locally manufactured aluminum clone of the French Adrian M26 was introduced on a small scale to the infantry. 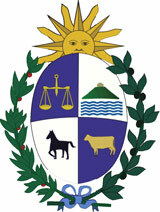 With the national coat of arms on the front, the new helmet was soon to become the symbolic emblem of the Uruguayan army. From 1944 forward the US M1 was introduced progressively, starting with the reserve forces). Following the signature of the Inter-American Treaty of Reciprocal Assistance (Rio Treaty) in 1947, military procurement became entirely American. The US M1 became standard issue and was made official by regulation N°10.588, dated December 17, 1947. This helmet would later be designated the Casco M76 Ejercito. The lightweight version of the helmet used for ceremonial purposes was decorated with the tricolor cockade of General Artigas. Beginning in the 1980s, Montevideo imported in small quantities, mostly from Europe, various models of the M1. Then in 2007, the M1 Corlon clone, manufactured in South Korea, appears to have become the standard-issue helmet for the armed forces. For foreign assignments the troops are normally issued the PASGT, including the type F6. The Air Force, the Navy and the armored units use a variety of mostly US, Israeli or Czechoslovakian helmets, corresponding to the origin of the military hardware in each organization.